Be sure to give a THUMBS UP, leave your comments, share with your friends and subscribe. Learn the Golf Swing Takeaway from PGA Golf Professional Herman Williams as he demonstrates how to make the perfect one piece takeaway for an on plane backswing. Herman reveals the common mistakes most amateurs make in the takeaway that lead to further swing plane errors in the golf backswing. 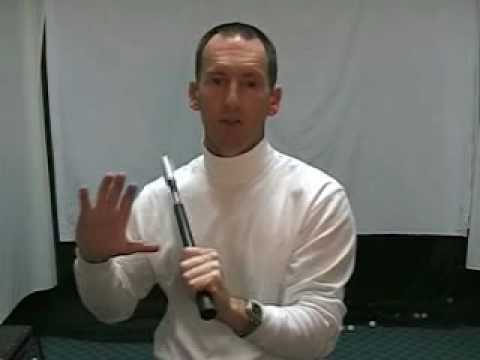 And he shows you a few popular misconceptions that you still see in modern golf instruction. Some of these common takeaway problems are the old "low and slow" sweeping the golf club back inside which gets the club off plane almost instantly. Then there is "fanning the clubface open" ... even a "toe up" position half way back is too open. And lastly, picking the club up to the outside. All of these takeaway mistakes send the club off plane and compound into further backswing problems at the top of the swing. Naturally, the transition to the downswing will be more difficult as a result, and impact will suffer as well. So the secret to developing efficiency and repeatability in the swing is to start the golf swing takeaway online, going straight back and in one piece. Watch a good player like Tiger Woods and notice the width and on plane extension in his takeaway. Tiger works hard to stay on plane as it is so much more efficient. Another key distinction to be made about the golf takeaway is the clubface position at the waist-high point half way back. Most golf instruction has this position incorrect, describing the "toe" of the club as pointing straight up. Herman Williams is known for the detail in his online golf lessons, and this video is no exception as he pinpoints the exact clubface position you should expect to be in at the waist-high backswing position. 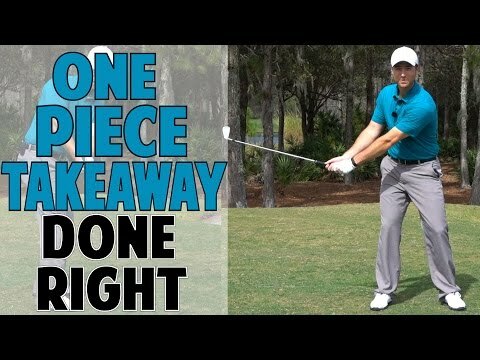 The clubface in a proper one piece takeaway will appear slightly "closed" with a 10-15 degree tilt downward toward the golf ball. This is just one of the many valuable nuggets you'll get from watching Herman go through the entire armswing motion for the golf backswing. Also in previous videos from Herman Williams, he has talked about the perfect golf setup and the importance of a neutral grip and flat left wrist to make the correct backswing. Today's golf swing takeaway video adds important related details to help further understand how the swing actually starts with a cupped left wrist but ends up with a flat left wrist. In the proper setup and takeaway, the cupped left wrist is maintained until the waist-high position, and then Herman teaches how to finish the backswing as the lead arm rises and rotates the club on plane and the wrist hinges into the "flat left wrist" position at the top. Some of these common takeaway problems are the old “low and slow” sweeping the golf club back inside which gets the club off plane almost instantly. Then there is “fanning the clubface open” … even a “toe up” position half way back is too open. And lastly, picking the club up to the outside. All of these takeaway mistakes send the club off plane and compound into further backswing problems at the top of the swing. 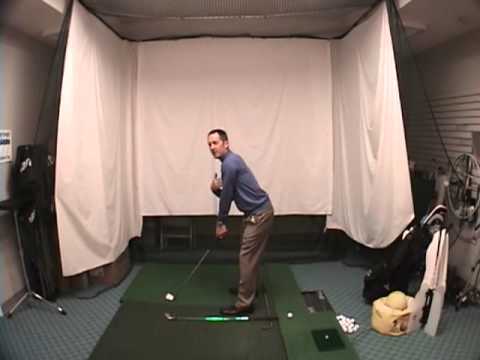 Naturally, the transition to the downswing will be more difficult as a result, and impact will suffer as well. Another key distinction to be made about the golf takeaway is the clubface position at the waist-high point half way back. Most golf instruction has this position incorrect, describing the “toe” of the club as pointing straight up. Herman Williams is known for the detail in his online golf lessons, and this video is no exception as he pinpoints the exact clubface position you should expect to be in at the waist-high backswing position. The clubface in a proper one piece takeaway will appear slightly “closed” with a 10-15 degree tilt downward toward the golf ball. This is just one of the many valuable nuggets you’ll get from watching Herman go through the entire armswing motion for the golf backswing. Also in previous videos from Herman Williams, he has talked about the perfect golf setup and the importance of a neutral grip and flat left wrist to make the correct backswing. Today’s golf swing takeaway video adds important related details to help further understand how the swing actually starts with a cupped left wrist but ends up with a flat left wrist. In the proper setup and takeaway, the cupped left wrist is maintained until the waist-high position, and then Herman teaches how to finish the backswing as the lead arm rises and rotates the club on plane and the wrist hinges into the “flat left wrist” position at the top. rotating the forearm and hinging the wrist was so perfect. I love your takeaway video which I have adopted into my swing. before I start folding and rotating. Keeping the toe hooded on the back swing is the most GOLDEN piece of info! precise than others I have found. take away), but that produces the “inside sweep away” you said not to do. already know the questions you’ll get so you answer them ahead of time. money for lessons over the years, and no one ever spotted this issue. As always Herman, a superb explanation of the take away, clear as a bell.